One of my favorite cafes in Kyoto, Japan is “Tosca Cafe“. It is an organic vegan cafe that uses local ingredients in Kyoto. The cafe has a very casual atmosphere – home-like, and there is a piano in the cafe! Unfortunately, Tosca was closed (in Feb 2018) because the Japanese owner is leaving for Finland. As a memory, I want to write down some special concepts behind the cafe and fabulous staff! The food concept at Tosca is based on “Macrobiotics” which are types of food drawn from Zen Buddhism. It attempts to balance the supposed yin and yang elements of food. Major principles of macrobiotic diets are to reduce animal product, eat locally grown foods that are in season, and consume meals in moderation. It is said that cancer patients and other chronic diseases can benefit from these diet. Inside the cafe, there is a big chalkboard decoration on the wall. The drawing and messages change every season. This is Tosca’s new year special set “Ozoni” (お雑煮). Ozoni is a Kansai (west Japan) style of New Year Mochi (rice cake) Soup. It is eaten on a special occasion – on the morning on New Year’s Day in Japan. 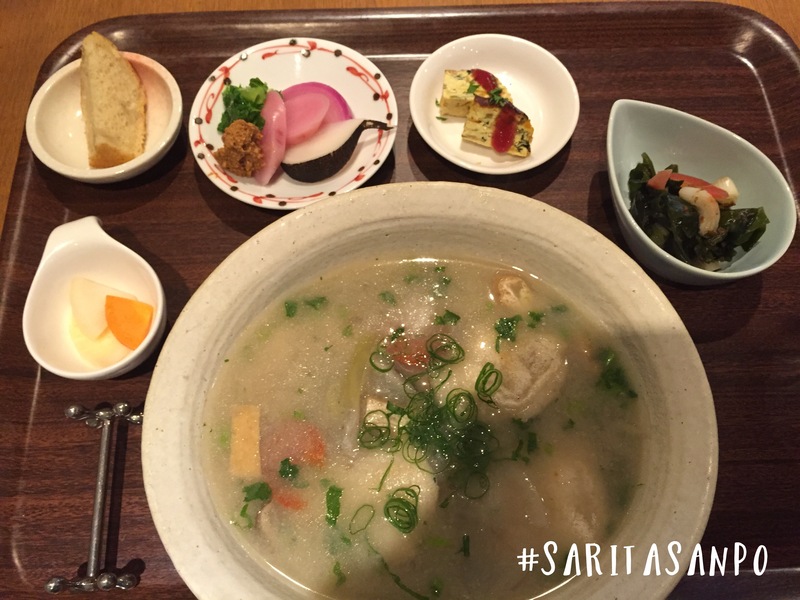 The ingredients include satoimo (taro root), daikon, carrot, toasted round mochi, and tofu. The soup is garnished with yuzu peel. Asuka-san, the owner of the cafe, is leaving for Finland. Although Tosca cafe is closed, but good memories are still here to stay. Great joy in life doesn’t come from being No.1, but comes from being the one. Find your own belief and unique voice, then show it through your work, show it in everyday operation.